We all have aperture fever, not just us crazy backyard astronomers, and with the latest announcement from the Canadian Government to provide nearly $250 million over 10 years, we should see the TMT operational in 2023-2024. 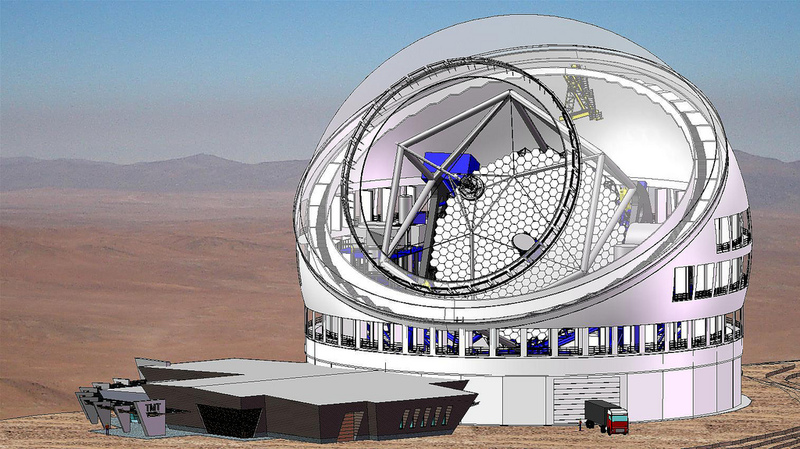 When completed it will be the largest telescope, until the Europeans have their European Extremely Large Telescope (E-ELT), also set for first light in 2024. The field of view of the telescope is 15 arc minutes (fully illuminated), or 20 arc minutes with slight vignetting at the edges of the field. At f/15, the focal length of TMT is 450 meters (1476 feet)! This means that the 20 arc minute field of view measures 2.618 meters (8.6 feet) in diameter. Current king of the largest light-bucket is the 10.4m diameter Gran Telescopio Canarias. Therefore the 30m TMT and the 39m E-ELT will be a considerable gain in light gathering power over the current crop of telescopes. Some are predicting that scientists will be able to directly observe planets orbiting distance stars, and perhaps even see distant oceans and weather formations. It’s always intrigued me how we spend so much on EQ mounts, when these large telescopes operate in a simpler Alt-Az configuration. This entry was posted in News, Science and tagged Astronomy, Canada, CBC, Science, Telescope, Thirty Meter Telescope by Benoit Guertin. Bookmark the permalink.